Installing Solar Panels in Oxford is still a good investment. Panel and inverter prices have fallen in recent months making now a great time to invest in Solar. The payment you receive from the ‘Feed in Tariff’ scheme, the export payment and the money you save by having lower electricity bills can still add up to returns of between 4-8% on your initial investment. Ofgem estimate that the average home uses approximately 4600kWh of electricity in a year. A 4kWp Solar PV system could generate over half of this requirement and would cost between £6,500 – £8,000 plus VAT (And you only pay VAT at the rate of 5% for domestic renewable energy projects). For larger commercial/agricultural systems please contact us for a quotation. These projects are quoted for on an individual basis as no two systems are the same. We do not just give a price per/kWp but carefully cost out the requirements of your project and prepare a detailed quotation on that basis. Depending on your electricity consumption the pay back period for commercial systems can be between 4/8 years and over returns of up to 15%. 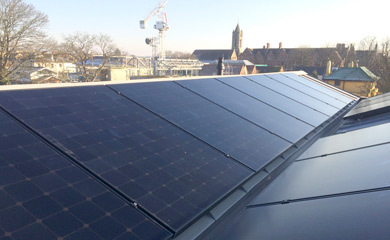 Because we’re local, employ local staff and have no sales people to pay, we can offer very competitive prices for your Solar Panel Installations in Oxfordshire and the surrounding area. We are always happy to provide free advice and supply a competitive written quotation. As well as our comprehensive ‘In House’ 5 year warranty, each domestic Solar PV installation is covered by a 5 year Insurance backed warranty provided by Quality Assured National Warranties (QANW). Insurance backed warranties are designed so that you are covered in the event of problems arising when the installation company has ceased to trade.